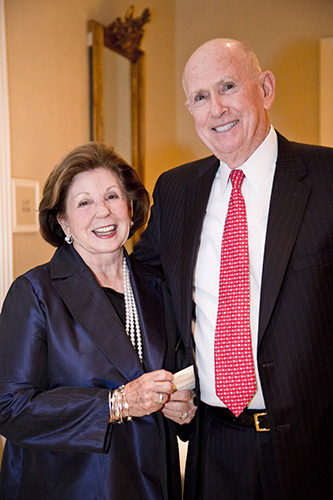 The O. Wayne Rollins Foundation has provided unprecedented support to Winship Cancer Institute and other Emory institutions. The history of Emory University could not be written without the Rollins name. 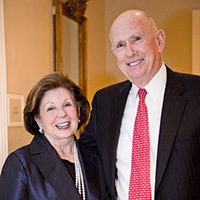 The O. Wayne Rollins Foundation, created in 1967 by family patriarch Wayne Rollins and his wife, Grace Rollins, has provided unprecedented support to the Woodruff Health Sciences Center, Rollins School of Public Health, Emory School of Medicine, Yerkes National Primate Research Center, the Candler School of Theology, and Winship Cancer Institute. Continuing the mission to promote science research and public health, the Rollins family established endowed chairs to support outstanding cancer research and care by Winship investigators. "The Rollins family gifts are gratefully acknowledged for creating a legacy that strengthens our commitment to research and clinical excellence," says Walter J. Curran, Jr., Winship executive director. "These endowed chairs enhance the national profile of the investigators and the institution." In 2010, a gift from the O. Wayne Rollins Foundation created the R. Randall Rollins Chair in Oncology, awarded to the late H. Jean Khoury, MD, Winship director of hematology and a pioneer in the development of personalized treatment for chronic myeloid leukemia patients. Continuing the family's philanthropic support for Winship, the family made a 2014 gift to create the Margaret H. Rollins Chair in Cancer, named in honor of Randall Rollins's wife. The chair was awarded to Mary Jo Lechowicz, MD, a Winship leader in hematologic cancers who specializes in research into novel therapies for lymphoma and has made her mark on future generations of cancer researchers through her outstanding mentorship. "The Rollins family has honored Winship and Emory University in so many ways," says Lechowicz. "Their keen understanding of the complex journey cancer patientsand their families must traverse has guided them to highlight research, patient care, and mind, body, and spiritual wellness. Winship is a different place with their help and their dedication. We are grateful for their many years of support." Randall Rollins once said "I'm a fellow who likes to see where the grass has been cut," a reference to seeing results achieved through the cancer research funded by his family's foundation. Those results are apparent throughout Winship.